The complete list of free instructions for origami diagram are given here in the oder of number of steps to learn. This is an animation instruction for children. This traditional sitting origami fox allows you to make a simple structure of sitting fox. This easy embossed origami star is simple to make as the four-pointed star. The only difference is you start with a regular-pentagon paper instead of a square one. This simple origami pyramid is very simple to make (11 steps). It is derived from a fruit base and a few steps away to make this model. This origami round dining table II starts from 8x8 matrix base and follow the complete steps of the origami round dining table. One special folding technique that you need to learn for this model is double rabbit ear-fold. This easy embossed six-pointed origami paper star makes use of a regular hexagon paper which can be converted from a square paper. The one essential folding technique involved with this model is outside reverse-fold. 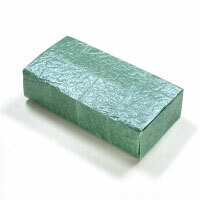 This 3D origami candy starts from 8x8 matrix origami base. The special folding technique involved with this model is rabbit ear-fold. It will take 20 steps to complete making this simple origami desk. The square coffee origami table is an easy model to fold. It requires you to apply a rabbit-ear-fold for four times. You need to apply chair-fold twice to make this origami bar table. This origami piano is probably the easiest origami piano you could make traditionally. 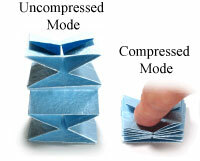 The initial sequence of folding is exactly the same as traditional origami house. One important technique that you could learn from this model is Squash-Fold. This origami star is originated from Calyx Base with five-sepals. This frog origami base is derived from fruit origami base. The fruit base is come from the well-know square base. You can also find the instruction of making a frog base from traditional origami frog up to the step #27. This easy embossed origami star is much easier to make compare to other one.</span> But it has its own beauty in simplicity. This jet paper airplane is similar to rocket paper airplane in the beginning folding sequences. The jet paper airplane flies in a straight direction as rocket plane does. The simple origami fan can be derived from making a strip by applying valley-fold and mountain-fold alternatively. There is no special folding technique involved with this model. This origami star box is a little more difficult to fold compared to other star boxes. You will apply both horizontal and vertical gate-folds initially. Then you need to apply a chair-fold. It will take 16 steps to complete this origami loveseat. This is 2D version of origami star. If you are an novice, wait until you are become more experienced in origami. This origami dining table larger than other origami dining table. The distinctive feature of this dining table is this table does not have a sharp corner. This origami tombstone is a simple model which can stand by itself. One tricky folding technique you will encounter from this model is to apply a mountain-fold on 1st layer while applying a valley-fold on the 2nd layer. This square origami table requires you to apply a crease pattern in the middle of folding sequence. You will need to apply both Z-fold and chair-fold to make this origami desk. This simple single origami bed requires you to apply Z-fold initially. You also need to apply chair-fold twice. Later, you will learn what 90 degrees valley- and mountain-folds are. This origami moon starts from a balloon base. The essential folding technique that you will need to apply is a modified version of open sink-fold. This 3D origami cup can be used instead of real cup. If you make this cup with a 20cm x 20cm paper, then the cup could hold the same amount of water as real coffee cup. Hot water can be contained since the cup has four handles. Make sure to use a waterproof paper when you make this cup. This Nestorian origami cross starts from 8x8 matrix base. One special folding technique involved with this model is swivel-fold. This origami hand allow you to make two skeleton hands for Halloween. One special folding technique that you need to learn for this model is inside reverse-fold. This simple origami bench starts with 4x4 matrix base. One special folding technique you need to apply for this model is chair-fold. The origami butterfly is based on so-called "twin-boat base". So you will learn what this twin-boat base is and how it is related to the butterfly. This origami box is very unique. If you need a box with no opening, this is the one for you. You need to learn what Z-fold and modified chair-fold are in order to make this single origami bed II. This hexagon origami ring starts with a half of a square paper. One special folding technique you will learn from this model is inserting one strip into the other. This traditional origami paper fortune teller shares the same initial folding sequence of traditional easy origami shirt. The special folding technique that you will learn from this model is cushion-fold which is to be applied for two times. The octagon origami dish makes use of a special folding technique called "Nail-Fold"
This origami round table starts from 8x8 matrix base. One special folding technique that you need to learn for this model is a rabbit ear-fold. The peacock origami fan can be started from a simple origami fan before putting glue on it. One special folding technique involved with this model is inside reverse-fold. This origami witch starts from a 16x16 matrix base. All you need to do is to apply a crease pattern after making a 16x16 matrix base. There is no special folding technique involved with this model. 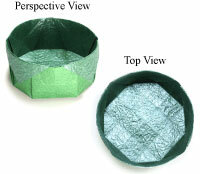 This simple origami bowl starts from 3x3 matrix base. One special folding technique that you need to learn for this model is reverse swivel-fold. This pinwheel origami letter starts from 8x8 matrix base. You need to apply two crease patterns given in this model. The origami heart with two back legs allow it to stand by itself. There are two special folding techniques that you need to know for this model. They are both square-fold and rabbit ear-fold. This origami table simulates the real coffee table. 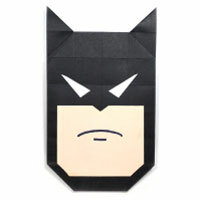 Initially you need to start with a 16x16 matrix base and then a crease pattern will be applied to make an origami man. This origami heart with a stand II has an origami heart shape on the front side. On the backside, it has a stand so that the origami heart can stand by itself. This origami flower basin starts from 8x8 matrix base. There is no special folding technique involved with this model. This simple origami sleigh starts from masked 8x8 matrix base. You will need to apply a simple crease pattern for this model. This spiral origami pinwheel starts from a 8x8 matrix base. You will learn to fold this model from a crease pattern. 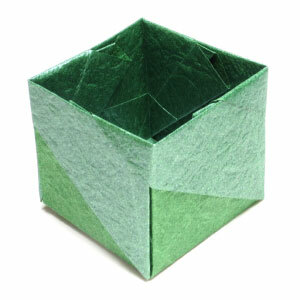 This flat square origami box is a open model. A special folding technique that you need to apply for this model is a petal-fold. You need to apply this petal-fold to inside of the box not outside. This origami dining table requires you to apply Z-fold initially. The essential folding technique that you need to learn for the subsequent folds is squash-fold. You will only need a single square paper to make this simple origami cube. This origami starfish starts from a regular pentagon paper. One special folding technique involved with this model is inside reverse-fold. This origami round table II starts from 8x8 matrix base and all you need to do is to follow the crease pattern carefully. This pinwheel origami letter II starts from 4x4 matrix base. One special folding technique that you need to learn for this model is squash-fold. This origami envelope has a double-bar on the back of the envelope. A special folding technique that you will learn from this model is reverse swivel-fold. Here I am using a A4 paper but you could use a letter sized paper instead. This new origami ninja star starts from 3x3 matrix base. There is no special folding technique involved with this model. The origami star box is a five-pointed star version of classical origami star box. 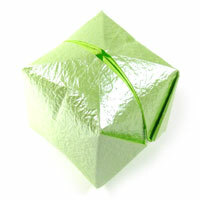 The origami star box is a five-pointed star version of cute origami star box. This origami angelfish starts from a square base. The essential folding technique that you will learn from this model is "locking folding". This technique is similary used for making a traditional sampan boat. This is 2D version of five-pointed origami star with seashell shape on the front. This heart origami boat starts from 4x4 matrix base. The special folding techniques that you need to learn for this model are squash-fold, inside reverse-fold, open sink-fold, closed-open sink-fold, and open-closed sink-fold. This origami sword starts from a diagonal matrix base. One difficulty in this model is that you need to apply a crease pattern after making a diagonal matrix base. This round origami dining table starts from 8x8 matrix base. There is no special folding technique involved with this model. This simple origami Santa starts from 4x4 matrix base. This will be the model for learning inside reverse-fold which will be applied many many times. 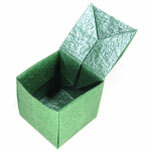 This origami box has a dimension ratio of length : width : height = 4 : 1 : 1. This 4x1x1 origami box starts from a 8x8 matrix base. You will learn to insert a flap into a pocket from this model. The origami dragonfly starts from bird base. One speical folding technique you will learn from this model is outside reverse-fold at step #12. This origami star starts from Calyx Base with six-sepals. This one makes a six-pointed origami star with a seashell shape at the center. This origami butterfly starts from a balloon base. The essential folding techniquen that you will learn from this model is open sink-fold. Also you will apply many times of inside reverse-fold. The instruction for embossed four-pointed origami star is given here. The total of 29 steps that you have to follow through. This origami house is 3D version of origami house. It is a little difficult to fold compare to 2D origami house. This medium square origami box doesn't make use of any base. One special folding technique that you need to learn for this model is 30 degrees valley-fold. This origami scarecrow starts from 12x12 matrix origami base. There is no special folding technique involved with this model. This simple origami stairs starts from a 8x8 matrix base. No special folding technique is involved with this model. This origami bar envelope allows you to make an envelope with a piece of paper. Of course you will not use a knife or scissors. This origami envelope has a butterfly shape on the back of the envelope. 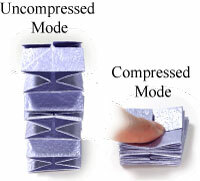 A special folding technique that you will learn from this model is inside reverse-fold. Here I am using a A4 paper but you could use a letter sized paper instead. New origami ball is different from classic origami ball (or balloon). It is not based on balloon base and it is somewhat larger compare to the traditional origami ball. The instruction for diamond-shape 3D five-pointed origami star is given here. You will clearly see the five-pointed star from the top view and the structure of diamond shape will be revealed if you title the origami start a little. The total of 30 steps that you have to follow through. This simple origami space shuttle is a beginner's version of space shuttle. It is quite simple to fold. One special folding technique that you need to careful about is inside reverse-fold. This origami piano is 3D model which is a little improvement compare to the traditional piano. 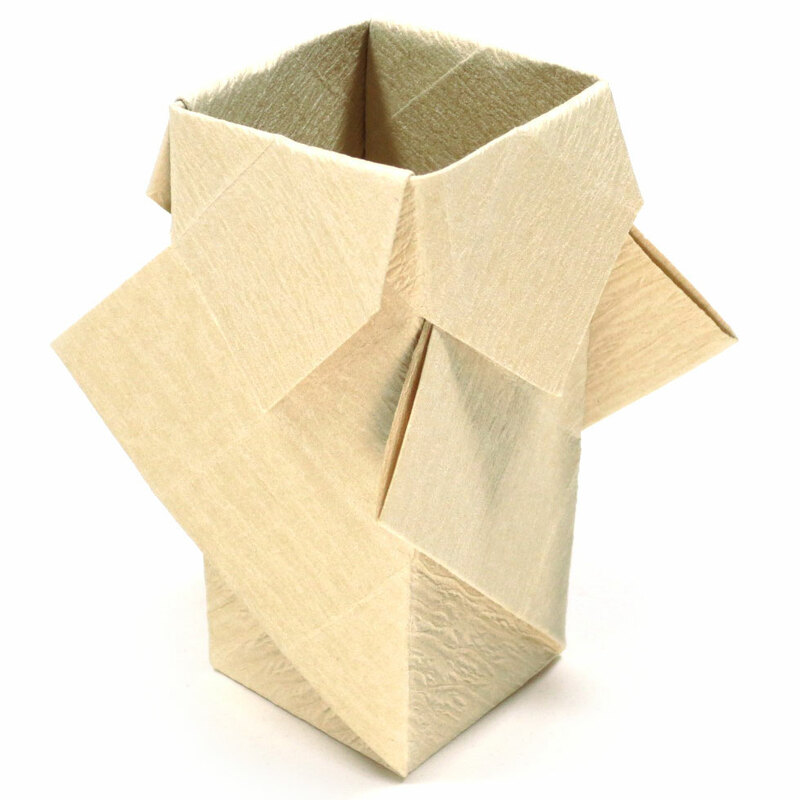 This 3D origami cup starts from a 8x8 matrix base. There is no special folding technique involved with this model. This simple origami Santa II starts from 4x4 matrix base. The special folding techniques that you would learn from this model are both square-fold and squash-fold. This origami butterfly V is not derived from any base. It takes 33 steps to complete this model. This origami star planet has a front planet with a five-pointed back star. There is no special folding technique involved with this model. This origami throne is a simple model to make. Three special folding techniques that you need to learn for this model are inside reverse-fold, nail-fold, and modified chair-fold. This new origami ninja star III only requires a single square paper. It starts from a square. No special folding technique to be learned here. In my opinion, this origami ball is easier to make compare to the traditonal origami ball. This origami star is originated from Calyx Base. This star is sharper compared to the one from Bird Base. This traditional origami snail starts from fruit base. One special folding technique you will learn from this model is bulging of eight shells. This origami pumpkin starts from fruit base. One special folding technique you need to learn for this model is inside reverse-fold. This rectangular origami vase starts from 8x8 matrix base. There is no special folding technique involved with this model. This is 2D version of four-pointed origami star with seashell shape on the front. This origami witch starts from a bird base. Two special folding techniques that you need to learn for this model is both open sink-fold and inside reverse-fold. Origami balloon is easy to make and then you can play with it after you make one. It is based on balloon base. The instruction for diamond-shape 3D four-pointed origami star is given here. You will clearly see the four-pointed star from the top view and the structure of diamond shape will be revealed if you title the origami start a little. The total of 37 steps that you have to follow through. You will need two sheet of square paper to fold this 3d origami tank. One paper will be used to fold the main body and another for making a turret and a main gun. This origami round table starts from 8x8 matrix base. No special folding technique was involved with this model. This origami jack-o-lantern starts from fruit base. One special folding technique you need to know is inside reverse-fold. You can put a candle inside after making this lantern. The embossed five-pointed origami star is similar in folding to the four-pointed star. The major difference is that you start with a pentagon paper instead of a square paper. This bulbous origami vase simulates a typical bulbous vase. The folding techniques that you need to apply for this model are gate-fold, inside reverse-fold and squash-fold. This diamond origami envelope starts from 8x8 matrix base. One difficulty you need to go through for this model is to apply a crease pattern (CP) shown at the step #16. This new origami ninja star only require a single square paper. It starts from a square. Special folding technique that you need to learn for this model is inside reverse-fold. This origami heart spring starts from square. You will need to apply a petal-fold and a crease pattern for this model. This long origami stairs starts from a 16x16 matrix base. A thin paper in recommended for this model. Origami crane teaches us two bases: (1) square base and (2) bird base. This model also let you learn what "inside reverse-fold" is. This origami heart with wings starts with a square base and it takes 43 steps complete. One special folding technique used in thsi model is "tail-fold". This 3D origami jeep is derived from 16x16 matrix origami base. It takes 43 steps to complete this model. This origami jeep is recommended to an intermediate level folder. This 3D origami wagon starts from a 16x16 matrix base. One special folding technique that you need to apply for this model is swivel-fold. This modular origami star model requires five pieces of square paper. 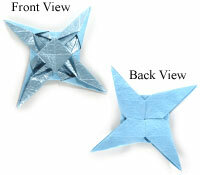 You will be starting with five balloon bases and then attaching them together to form this origami star. One special folding technique that you need to know is inside reverse-fold. The origami heart over the moon is not advised to try for origami novice. Special folding techniques involved with this model are Z-fold, swivel-fold, and rabbit ear-fold. 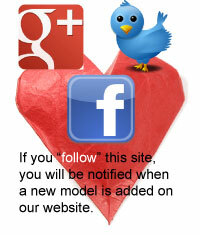 The instruction for folding 3D origami heart is given here. This spell-casting origami wizard starts from 4x4 matrix base. One special folding technique involved with this model is square-fold. If you are a novice in origami, please don't try this one now. It is somewhat difficult since it takes 55 steps to complete. The essential folding technique that you need to know is open sink-fold. The distinctive feature of this origami sun is the face of the sun actually sticks out of the background flame. The instruction for folding 3D open origami heart is given here. Since you have an opening on the top, you can put something in this heart and take it out easily without destroying the origami heart. This arm-crossing origami wizard starts from spell-casting origami wizard. So you need to make a spell-casting origami wizard first. This fancy origami ninja star starts from a 8x8 matrix base. There are two special folding techniques involved with this model: (1) modified squash-fold (2) modified petal-fold.